Published in the series, Sociology of Crime, Law and Deviance, Volume 14. Scroll down for pdf copy. Bingley, UK, Emerald Group Publishing, 2010. 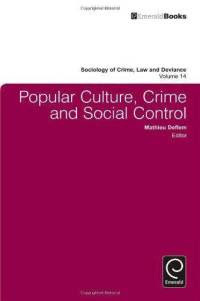 This volume contains contributions on the theme of popular culture, crime, and social control. The chapters in this volume tease out various criminologically relevant issues, pertaining to crime/deviance and/or the control thereof, on the basis of an analysis of various aspects and manifestations of popular culture, including music, movies, television, paintings, sculptures, photographs, cartoons, and the internet-based audio-visual materials that are presently available. Thematically diverse within the province of criminology, the chapters in this book are not restricted in terms of theoretical approach and methodological orientation. Using a variety of methodological and theoretical perspectives, the volume is diverse in addressing dimensions of popular culture in relation to important criminological questions. This volume appears as Volume 14 in the series Sociology of Crime, Law and Deviance. Rap Music’s Violent and Misogynistic Effects: Fact or Fiction? This book is available as a pdf file. Physical copies of this book can be found in online stores and via resellers.